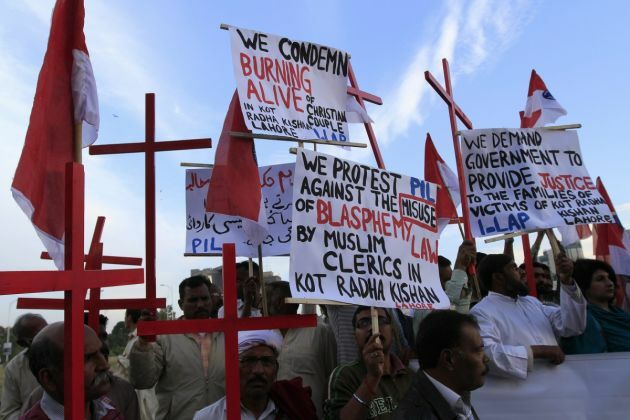 Civil society groups in Pakistan are up in arms accusing the police of torturing a 20-year-old Christian who died in custody after his mother had been accused of stealing from her Muslim employer. Lahore police officers are accused of killing Zubair Masih. He had been brought to the police station along with his family after his mother, Ayesha Bibi, was charged with stealing gold items from her employer, the Center for Legal Aid Assistance and Settlement (CLAAS) said. The center's report, said the young man had been "violently tortured throughout the night" and his body had been dumped "dumped in front of his parents' house" the following morning, asianews.it reported on March 12. The victim's mother, Ayesha, had been accused of stealing gold items worth $350 by her employer. The employer brought with him a handful of police officers at their house, rounding out the woman and her family, and brought her to the police station for questioning, according to the report. At the police station, officers are said to have beaten up Ayesha, who purportedly owned up to the crime and returned the gold items, while maintaining her innocence. After recovering his possessions, the employer purportedly beat the woman up while police officers turned a blind eye. Later on, the police trained their sights on the woman's family making them undergo questioning while being tortured. The family was released in the evening, except for the Zubair. The family expressed worry about him, fearing he may have undergone violent torture while in custody. Their fears were realized after they saw the lifeless body of Zubair dumped at their doorstep. The family mounted a protest action at the police headquarters, as anger over the death snowballed into a movement involving civil society and other cause-oriented groups. Under intense public pressure and scrutiny, investigators opened up a probe into the torture accusations. Of Pakistan's population of some 182 million people, 97 per cent are Muslim. It is the sixth most populous country in the world and the second biggest Muslim nation after Indonesia.